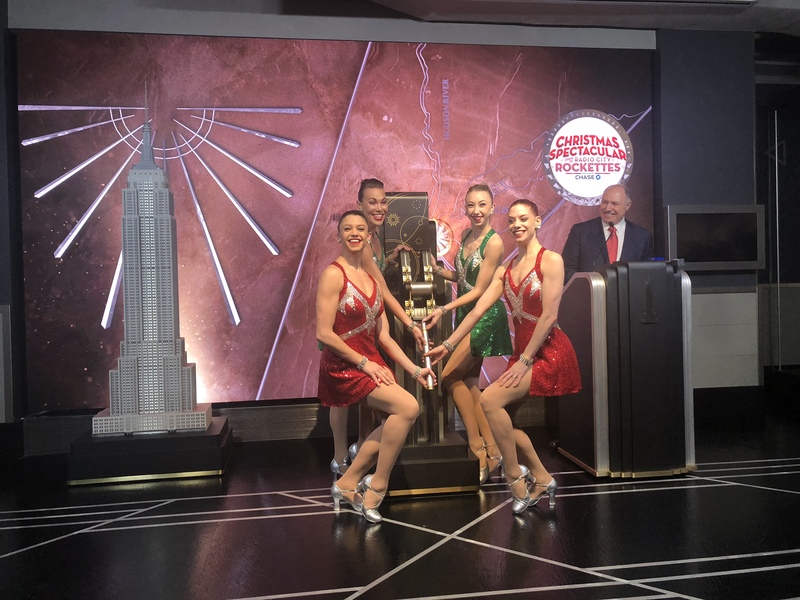 On Thursday morning, the Radio City Rockettes kicked off the holiday season by lighting the Empire State Building in red and green, in celebration of the opening night of the Radio City Music Hall’s Christmas Spectacular. The four Rockettes also helped to debut one of the Empire State Building’s iconic Christmas windows, which featured a small statue of the classic building, along with a festive blue background and silver ornaments. This year, the 34th Street and Fifth Avenue windows were designed by Mark Stephen Experiential Agency. They will feature a variety of Empire State Building replicas, one even made of gingerbread by Madison Lee Cakes. “We are so thrilled to be here today to light up the Empire State Building in red and green in honor of our opening night,” Kristina Larson, a veteran Rockette for the past eighteen years, said as she pulled the lever down to illuminate the building. The routine will feature over one hundred Intel Shooting Star mini drones, which will envelop Santa Claus in a series of bright patterns. The new scene is directed by Sam Buntrock, a Tony-, Drama Desk- and Olivier Award-nominated director, who has said he is proud to be bringing the first live theatre experience to the Radio City Music Hall. The show, which opened Thursday night, will feature four shows a day, until January 1. Larson and the other Rockettes seem excited about debuting the new scene they’ve practiced for months, and they display confidence that the show will “immerse the audience in the magic of Christmas,” as it has since its inception.